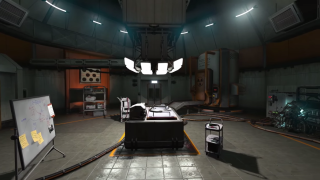 As Andy said in his hands-on preview of Frictional's new sci-fi horror game Soma, the underwater research base does have the same kind of feel as the Nostromo from Alien. This new trailer takes us through some of those unfamiliar environments, including several that look as though the sea has successfully invaded the base. As with the trailer about dying that we saw at E3, there's a voiceover—this one female rather than male—that doesn't seem to be directly related to the footage, but it's definitely intriguing. Along with the trailer, the team at Frictional also answered a few frequently asked questions. Apparently Soma will be "just as scary, if not even more so," as the developer's previous game Amnesia: The Dark Descent. It'll also have puzzles, and you'll get some of the narrative from objects like notes in the environment, though Frictional promises they'll be "coherent" i.e. their existence and placement will make sense. Soma is out in a few weeks, on September 22. If you want to see more footage, there's a longer video here.